Philip (phil) along with is wife Annie, come respected in and around Our Council and Parish. 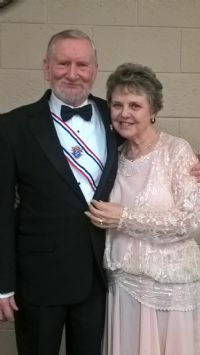 Phil is a superior Great Knight, he has guided me and helped me tremendously though out my position as Grand Knight. Phil & Annie are always there in support of Our Council and the many projects we do. They both deserve this award. They reach out and touch so many lives. Phil & Annie support our Parish always. They attend Mass on a regular basis and with the lack of volunteers, They both are Eucharistic Ministers serving as Gods servants. And I am sure if called on, Phil would serve as a usher. They have helped with the 24hrs. for the Lord program helping with food drive. Phil and Annie have been supportive of the community festivals, and food pantry. Phil has marched in the right to life program, and when we do a festival parade he has marched in the past. Phil and Annie were chosen by our council for outstanding work in and around the Council. Phil being Membership director has contributed more then he could imagine. He has touched the hearts of many new members coming in to the council making them feel right at home. I can still recall the first time I signed up for the KofC and I was so nervous because I have a hard time talking and meeting new people. Phil took me under his wing and said not to worry and guided me to be a stronger person. Very time I start a meeting I think back to how Phil eased the tension I had coming into the KofC. I look to him as my big brother. He & his wife make everyone feel right and home. They both truly deserve this award and it will a great great honor to hand out this award. I cannot thank Phil and Annie enough for the support and the friendship they have for the council and Parish. Robert (Bob) & Nancy have been voted by Our Council as Family of the year. It goes with out staying that the members made a great choice. They are very active in the council activities from cooking, to planning meals, working at Bingo. Bob attends all meetings, and plays an active roll in the meetings. They both come highly respected, and It is an honor to have them as our Family of the Year, two years in a row. Congratulations!!!!! !